I wrote out some scripts that was intended to query a database, update some rows, and save them back. When I attempted to run them, it seemed like the changes wouldn't go through. After some long debugging sessions and major alterations to my script, I eventually found out that the name of some methods was causing the conflicts. It wasn't public/protected, there was no override, there was no warnings so I expected no issues. I eventually ended up renaming that method to FixMyTable(MyTable) and everything worked out. I think that LINQPad should be able to detect this situation and at least warn about it. There might be legitimate cases where we'd want to actually override it, but I would have expected the override modifier would be required. This results in an immediate green underline, and when you run the query a warning symbol in the editor margin - CS0108 SubmitChanges hides inherited member 'DataContext.SubmitChanges'. 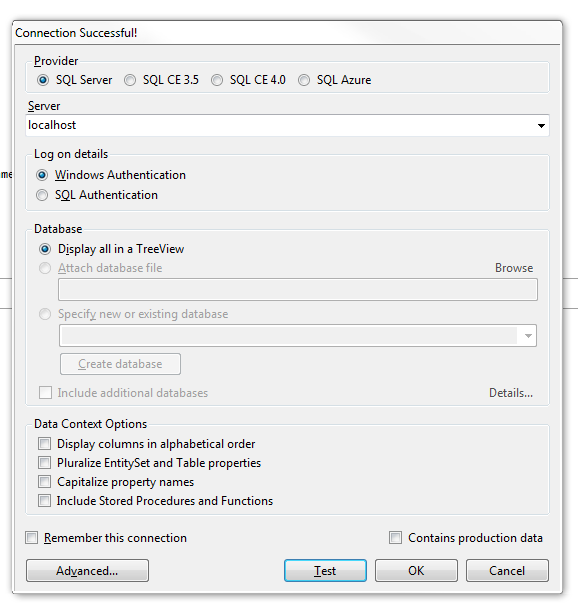 I have been using the default LINQ-to-SQL driver. I'll have to double check my connection settings when I get to the office next week, but I'm pretty sure I didn't pluralize the table names and I wonder if that would make a difference. I probably could have checked the stack trace as I was debugging too, it might have revealed more. 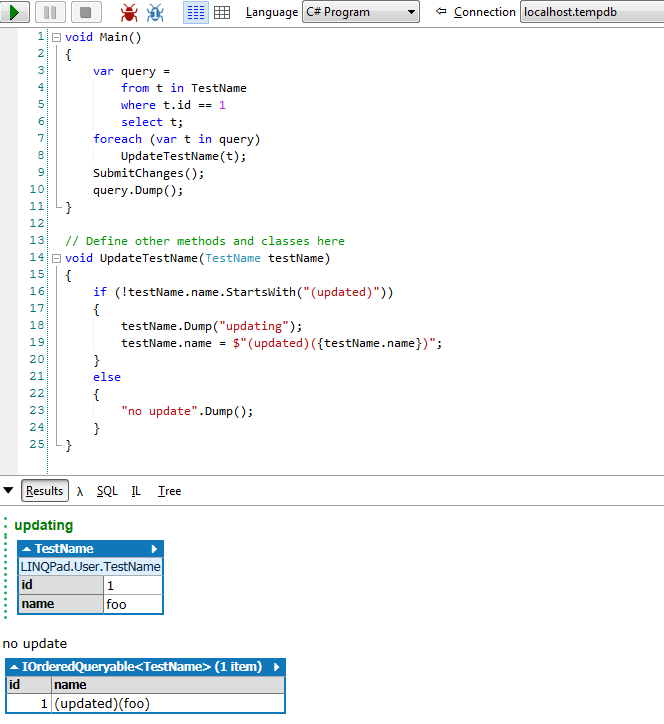 But in my attempts to determine what was wrong, I moved the calls to SubmitChanges() in and out of methods. When I put it in the update method and stepped through, it immediately jumped to the top of my update method. I don't know if it would be appropriate for me to post the exact code, but I'll come up with something representative of how it was set up. Here's a simple test case I set up using v5.26.01 (any). In the end, the table doesn't get updated. I could rerun the query multiple times and the table will still be untouched. There are no further errors. This doesn't require an override because there is no method to override, but Linq2Sql is just looking for a method with this name and uses it if it exists. I'm not sure sure what the advantage of 'duck-typing' is in this case, but one big disadvantage is that you do not get compiler warnings if you happen to use one of those special names for your own methods and if you are not aware of these special names (and I admit I wasn't until I read this thread), then you can end up with unexpected behaviour.